BPVC-IID-2015 Customary is a service book to Code Sections providing tables of design stress values, tensile and yield strength values, and tables and charts of material properties. Part D facilitates ready identification of specific materials to specific Sections of the Boiler and Pressure Vessel Code. 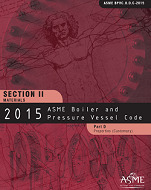 Part D contains appendices which contain criteria for establishing allowable stress, the bases for establishing external pressure charts, and information required for approval of new materials.